Why can't New England get an address straight? 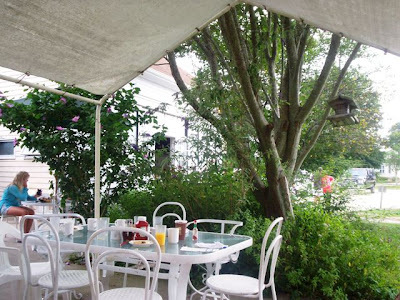 When Liz - our number one fan - suggested a while back that Mom and I visit The Barn Restaurant in Little Compton, RI, we decided to look up the address. What we found was that it was in both Little Compton and Adamsville, and on both East Main and Main Road. How is this possible? Also, the building number was listed as zero. What address begins with zero? Anyway, as luck would have it, Mom and I decided to turn left onto the street that we've been turning right on for years and ran right into The Barn. We pulled into the parking area at just about 10:30 a.m. Mom and I have never felt as fat as we did when we walked into this place. The inside dining area was filled with the kind of slim, attractive people that you would never see walking around Wal*Mart in a t-shirt and flip flops. A young waitress approached us and I notified her that we would like to eat outdoors (I spotted the patio area when we drove up). She showed us to a table and handed us two plastic menus. Outside sat another bevvy of beauties, which meant that Mom and I were the only two in the restaurant that could have auditioned for The Beverly Hillbillies. 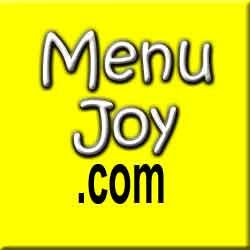 Putting our washboard and jug aside, Mom and I looked over the menu. A few minutes went by before we were greeted by our waitress, who we later found out was named Terry. Terry asked us what we wanted to drink. Mom went with a cup of coffee while I chose iced coffee. Mom got her coffee right away, but I had to wait a bit for mine. This may have been because the restaurant was really crowded. When Terry finally arrived with my coffee, we placed our order. At first, Mom wanted to have an omelet with sweet bread French toast instead of the regular bread that always accompanies omelets. Terry responded, "Oh no, we can't do that," like it was unheard of for people to ask for substitutions. Mom had to go back to the menu and finally settled on the Barn Yard ($9.25) which she had with her choice of bacon and American cheese (inside the omelet) with rye toast. 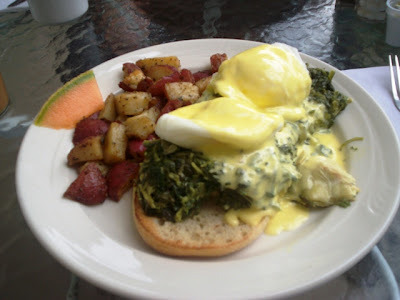 I chose the Eggs Sardou ($9.50) which were two poached eggs on top of a bed of spinach, garlic, hollandaise sauce, and two English muffin halves. Terry took away our menus as Mom and I joked about the name of her omelet, and how my fancy-sounding dish lost its snobbery when we noticed that it came off a list of "Barnyard Specials." Mom and I noticed that we had been waiting a little long for our food to arrive. We hadn't seen Terry in a while, but soon spotted her walking toward a nearby table with a tray of drinks - on her head. Either she has one of the flattest heads in America or she is just extremely well-balanced. Everyone started clapping when Terry arrived at her destination with all drinks still in their glasses. She then disappeared again, but reappeared to loudly announce to us - and only us - that our food would be out shortly. She said that she didn't want us to "worry," and that it "wouldn't be nice" if our meals had been forgotten. I guess they didn't want to upset "Granny" Moses and Elly May Clampett. The Barn has a small, but varied breakfast menu. 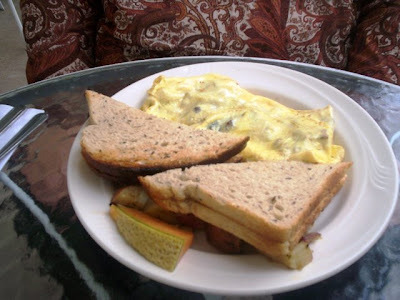 Specialty omelets include the Six Gun, V-8, Florentine, and Portuguese (all $9.25). They also offer the Westport River ($10.95) which includes lobster, broccoli, and Swiss cheese. "Barnyard Specials" include sausage gravy and biscuits ($8.50), corned beef hash ($8.25), and various versions of eggs Benedict ($8.50-10.95). Other items include extra thick French toast ($5.25), Adamsville Jonny cakes ($3.95), homemade muffins ($1.75), baked Irish oatmeal with apples, raisins, and walnuts ($4.50), cheese omelet ($7.25), and a variety of breakfast sandwiches ($5.95-7.25). 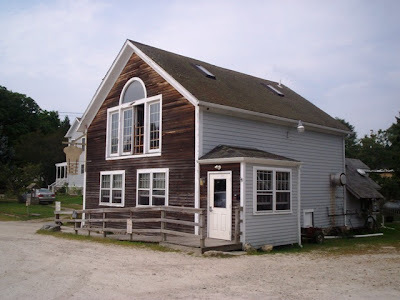 We also read that The Barn is available for private parties and functions. When the food finally did arrive, both plates - which were garnished with a piece of melon - looked amazing. Mom's omelet was quite large and filled with bacon and cheese. The bacon was thick and meaty and the omelet was cooked perfectly. The rye toast were also large and delicious. Mom wondered if they came from a homemade loaf since they were bigger than average. She even enjoyed the cup of coffee that she'd been nursing throughout our visit. Her dish came with potatoes, but she did not have any of them. My breakfast was also fantastic. Now I have a love/hate relationship with eggs. I'll only eat them when they're mixed with other things (i.e., omelets), but this different version of eggs Benedict was extremely flavorful. The eggs were cooked very well, and the spinach, garlic, and hollandaise sauce was very fresh. The potatoes that accompanied my meal were seasoned with rosemary (I think), which gave it a great taste. I also enjoyed my iced coffee very much. A bit on the expensive side, but the meals were very fresh and I'm almost sure that they use produce and dairy from the nearby farms (or at least they should). We were going to leave $30 on the table for Terry, which included a 20% tip, but we couldn't find her. Since we wanted to use the restroom before our long drive home, we decided to take the bill and the money indoors. Inside, we spotted Terry and were able to hand her the cash. When we used the small restroom, we found it to be neat and clean. As Mom and I headed back to the car, we spotted Terry walking with yet another tray of drinks on her head. She really has a knack for that, and the customers seem to enjoy it. All in all, we thoroughly enjoyed our visit to The Barn. This place is definitely an out-of-the-way treasure that we would have never come across if it weren't for Liz. 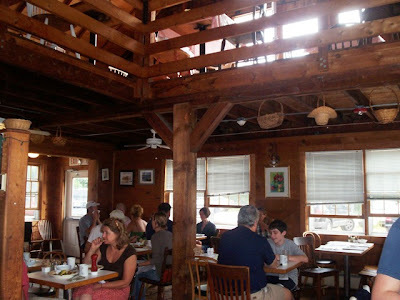 Although the prices are high, you really do get a good meal at an adorable New England barn. I guess that's why it attracts so many vacationers. No wonder we felt so out of place - we were one of the few who really lived in Bev-er-ly ... Hills, that is ... swimmin' pools ... movie stars. 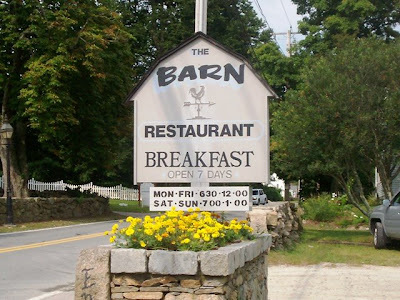 The Barn Restaurant is open from 6:30 a.m. to 12 p.m., Monday through Friday, and 7 a.m. to 1 p.m. on Saturday and Sunday. Now I'm not sure if this is only for breakfast, but Mom is pretty certain that she saw a sign that said The Barn serves lunch and dinner. If so, I'm sure the place is open a lot later.